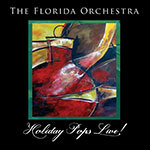 Featuring music recorded live by The Florida Orchestra and The Master Chorale of Tampa Bay during the 2013/2014 season Holiday Pops program conducted by Jeff Tyzik. Get into the spirit of the season with Sleigh Ride, Rudolph the Red-Nosed Reindeer Rag, Carol of the Bells, Gospel Hallelujah, Duke Ellington’s Nutcracker Suite and more. Buy directly from The Florida Orchestra! This CD can be purchased through The Florida Orchestra's Ticket Center for $10 by calling 727.892.3337 or 1.800.662.7286 and in the lobby of the concert halls at the orchestra's performances. We are proud to announce that this CD made it to #1 Best Selling Opera/Vocal recording on Amazon and #2 on iTunes! In addition, Delius CDs can be purchased through The Florida Orchestra's Ticket Center for $20 by calling 727.892.3337 or 1.800.662.7286 and in the lobby of the concert halls at the orchestra's performances. Click here to listen to an interview of Dr. James K. Bass about the Delius CD on Minnesota Public Radio. Click to read the following articles. The recording includes English composer Frederick Delius' Sea Drift andAppalachia: Variations on an Old Slave Song, both of which feature baritone Leon Williams, The Master Chorale of Tampa Bay, and The Florida Orchestra live in concert. Both works were recorded during the past season's Tampa Bay Times Masterworks program "Celebrate Delius" at the two performances at the Progress Energy Center for the Arts Mahaffey Theater on January 6 and 7, 2012, and released on the Naxos label, the world's largest independent distributor of classical music recordings.